When decorating for the holidays consider upcycling materials from around your home instead of buying new. 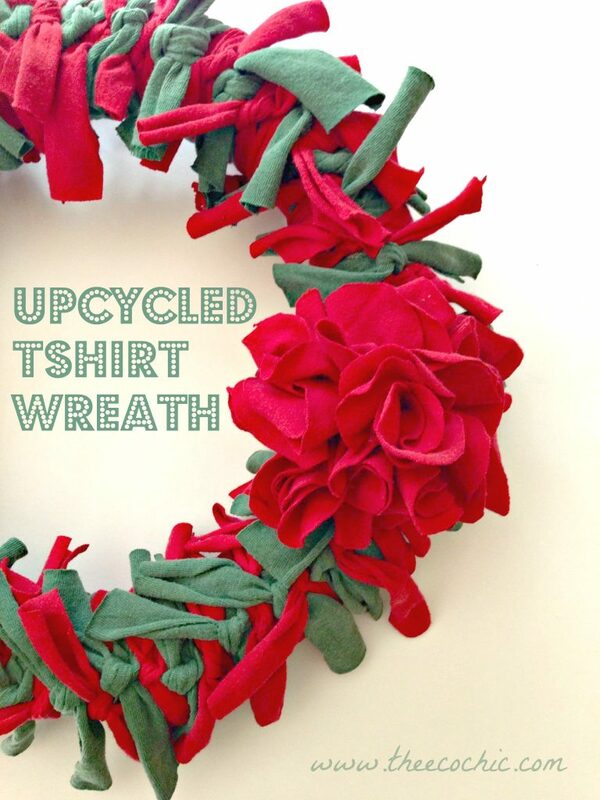 I have a million and one old tshirts that I saved for crafting and couldn’t wait to try making an upcycled wreath. This project was inspired by the upcycled wreath that I made for my daughters room using a bed sheet. Directions: Cut fabric strips approximately 1-2″ by 6″. 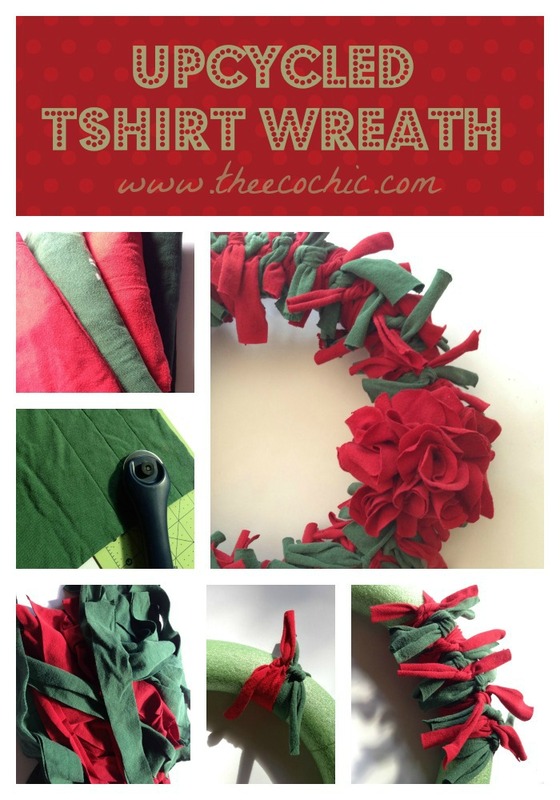 Tie each strip onto the wreath form with a simple knot. 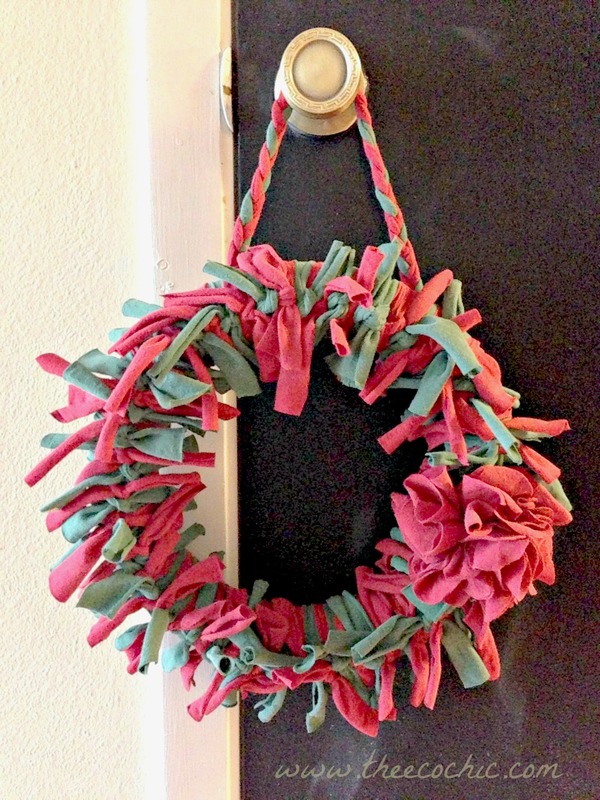 Continue tying strips to the wreath until you fill up the entire form. Embellish with a fabric flower. (Directions for the tshirt fabric flower can be found at Emily’s Little World blog.) I used tshirt scraps and braided them to for the hanging ribbon for this wreath. You can use straight pens to attach the braid to the back of the wreath. Hang your wreath and enjoy! Happy Holidays! This is such a great way to upcycle old t-shirts and bed sheets! Thank you for the eco craft idea! There’s no way that I would know this was upcycled. It’s fantastic. Pinning it. This turned out amazing! Love it. I love this! It’ amazing what you can do with some simple t-shirts that aren’t being used anymore. I did the same thing with some baby supplies i got from gogonatural.com, that i didn’t use any more it turned out so cute!